Reading Priorities | What a Beautiful Mess! I’m not a well read person, I must admit. I love to read, but I’m very aware that my choice of books is sometimes questionable. Oh, I believe all reading is good, to immerse myself in a story and forget about reality for a time is gloriously freeing, but I know there’s a ton of literature out there that’s well worth reading. I need to open myself up to reading something that takes me to places I’ve never been. I’ve been to Stephen King’s world many many times, I’ve read about murders, in true crime and in fiction, so many times that I’m amazed it doesn’t affect me in some way. I’ve read westerns where the fast gun has been romanticized over and over again. I read romances, the bodice rippers where the endings are always happy, and I’ve read Nicholas Sparks, never managing to not cry during it. But, I have to say I don’t read enough classics! I’ve not read anything by Hans Christian Andersen or Jack London……I’ve always meant to read Louissa May Alcott, Mark Twain, and J.D Salinger, but haven’t…yet. I should discipline myself and read even one classic for every 5 general fiction books I read, then maybe I’ll consider myself well read. I guess if one considers Dr. Seuss a classic author then yes, I’m very well read, because ‘Hop on Pop’ and ‘Horton Hears a Who’ should be considered classics! 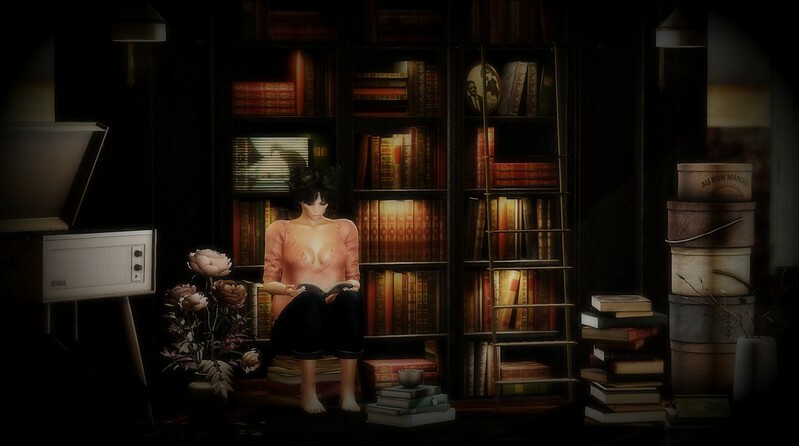 I’ve talked about reading before, so you know I love to read, but this time I mention it because KraftWork is releasing the ‘James Joyce Library’ in the March round of Deco(c)rate, and this round is sure to be a great one! The theme for March is ‘Days in Dublin’ and if the teasers are any indication this is one I’ll be getting! But back to the library, it has a land impact of 14 when in it’s entirety, which includes the books and shelving, ladder, and lights. The lights are on/off on touch and the ladder has a reading animation, which I’m not using here, as you can tell. 🙂 The set includes each part individually or as a set to rez all at once, which I did for this. The textures are highly detailed with rich colours which makes a perfectly intimate reading area. The Deco(c)rate subscription box will be delivered March 8 at noon SLT, but you only have until midnight of March 7 to subscribe! You can find a kiosk at the KraftWork main store or at the Deco(c)rate Headquarters. I chose to settle in and read a little bit here using the ‘Double Booked’ pose and pose props from the ‘Book Lovers’ set of pose/props from Le Poppycock. The props include books, book piles and cats….every library needs at least one cat! As for my other clutter in the library? Well, it includes books, of course! The ‘books & tea’ beside me is from tarte and the tall pile of books to my left is a group gift from Nutmeg. The ‘Sepia Peonies’ are from NOMAD and the ‘hat boxes’, ‘Hello Billy-vase’ and the ‘rug’ are from gacha sets from Apt B. The ‘Bermuda Turntable’ is from .:revival:.. And for my outfit, I’m wearing the ‘boyfriend jeans, dark wash’ and the ‘Deep V Sweater, blushed’, both from fashionably dead. The ‘Vanilla’ hair is from [monso]. And, my look all starts with the ‘Raine’ skin in ‘miel’ tone from Avada on the ‘Lilo’ bento head from Catwa and the ‘Lara’ mesh body from Maitreya. You can also find me on my blog, What a Beautiful Mess!.